The Muppets are back in outer space. 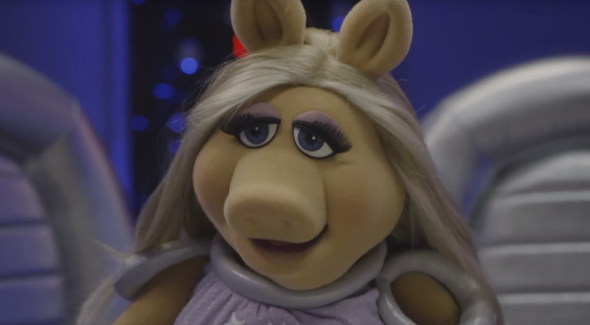 This week, a new “Pigs in Space” sketch was released online, Culturess reports. The Star Trek spoof was a recurring bit on the original 1970s Muppet Show. The sketch features the adventures of Miss Piggy, Captain Link Hogthrob, and Dr. Julius Strangepork as they travel on the spaceship Swinetrek. The newly released sketch marks the return of “Pigs in Space” after nearly 20 years. The sketch, titled “Alien: Look Who’s Coming to Dinner,” is the first episode of a planned “Pigs in Space” web series. What do you think? Are you a fan of The Muppets? Are you glad they’re reviving “Pigs in Space”? More about: ABC TV shows: canceled or renewed?, The Muppets, The Muppets: canceled or renewed? The Muppets: Cancel or Renew for Season Two? The Muppets: What Changes Were Made to the New ABC Series? The Muppets: ABC Wants to Save the Series; Should They Cancel It?